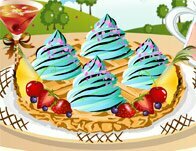 Description: Without these delicious waffles, breakfast just isn't breakfast! And the best part about this sweet breakfast treat is you can put whatever topping you want! Whether you want a nice fruit filled topping for a healthy start, or waffle-filled rocket toward a sugar rush with syrup, chocolate, and cream! Instructions: Use your mouse to click on and through the various toppings. Aaaah waffles are one of the best things in the world to eat! Do you agree? 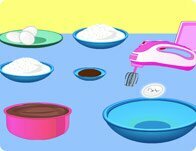 In this game you will learn how to make your own waffle house breakfast, follow the stept and become a real master chef!